Longtime readers know I'm a vetiver fiend, so I was excited when I heard about the new Vetiver Attars from Los Angeles based aromatherapist and perfumer Persephenie. They're attars in which the florals (and other notes) are hydro-distilled into a base of vetiver oil instead of the more traditional sandalwood. And those of you who read the original announcement might remember that they're expensive — $64 each for 4 ml — as is generally the case when a small indie brand is doing their own distilling (Strange Invisible Perfumes being another example). * I tried all five; here are brief reviews of three: Blue Lotus, Parijata and Tuberose. The blue lotus flower is considered sacred, representing clarity, devotion, and prosperity. The Blue Lotus Vetiver Attar is the exquisitely scented blue lotus flower hydro-distilled into vetiver essential oil. This is the mildest of the five fragrances, and the cleanest, although it does have a slightly spicy, slightly fruity undertone, especially in the early stages. I don't know if this is the same blue lotus as Nymphaea caerulea, but it smells a lot like water lily, or at least, like the water lily note commonly found in perfumes. The top notes are simply lovely, but it gets milder and fainter as it wears on skin. Within the hour, vetiver is the prominent note, with just a tinge of something vaguely floral — if you don't particularly like vetiver to begin with, Blue Lotus may not have enough floral oomph to tempt you. Even "plain" vetiver oil smells great to me so I found this one enjoyable, but it didn't really capture my heart. The parijata flower (also known as Coral Jasmine) is a night blooming blossom that grows on a small tree. Its scent has been compared to a combination of orange flower and jasmine. Ethereal and narcotic, parijata is considered a wish fulfilling gem. The fallen aromatic flowers are collected from the ground and placed on altars as an offering in India. The description is accurate: Parijata smells like orange blossom and jasmine, although I'd reverse the order: the opening is a like a gorgeously rich (and yes, narcotic) jasmine, then as it warms on skin, it slowly gets brighter, cleaner, and closer to something like orange blossom, with its typically soapy edge. A couple drops of Parijata lasts for ages, and the florals stay strong and deep throughout, with a beautifully spicy undertone. My favorite of the five: lovely, and highly recommended. The tuberose flower is picked immediately before the buds open. It's powerful fragrant flowers continue to exhale their mesmerizing scent long after they have been plucked. Tuberose is another one of my favorite notes, and the Persephenie version has the typical odd-but-satisfying opening of a tuberose-heavy fragrance: almost wintergreen, with a touch of Bandaid. When that fades, it comes closer to the exotic hothouse flower. I loved this one for an hour or so, but over time, it doesn't maintain its floral depth as well as the Parijata, so that the vetiver takes over. I kept reapplying to amp up the intensity of the tuberose. Verdict: These are interesting and nicely done, although if you don't like vetiver, you may not find it worth your while to sample. Although they're expensive, as a general rule you really do need only a few drops at a time, so the 4 ml bottle would probably last longer than you might think. If money were no object, I'd buy the Parijata and Tuberose. If I could have just one, I'd take the Parijata. Since money is very much an object, I won't buy either, but I'm going to use every drop of my samples and miss them when they're gone. The other two fragrances in the group simply did not work for me. Kewda promised "bright hypnotic notes of hyacinth and honey" but smelled oddly unpleasant (and nothing like hyacinth) on my skin. 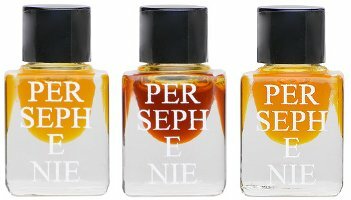 Persephenie says Hina "has all the nuances of a well rounded perfume", and that's true, but the blend of sweet and earthy notes wasn't "me" — still, I wouldn't be surprised if this one was a general favorite, and it was definitely the longest lasting of the five. If your tastes run more to orientals than florals, Hina is probably your best bet. Persephenie makes some other products I'd love to try, including Rose & Frankincense pastilles, Nanu Lei butter scented with gardenia, Neroli Body Oil and several perfumes. Please comment if you've tried anything from the brand! The Persephenie Vetiver Attars can be found at Beautyhabit in $64 each for 4 ml. * As nozknoz points out in the comments, it's not really clear from the website whether the brand is actually doing their own distilling or purchasing the finished product elsewhere, so I should not have used the wording "doing their own distilling". Robin, I’m curious — just how strongly do these smell of vetiver? To me, vetiver is such a strong scent that it’s hard to imagine it not totally overpowering the floral elements. Maybe the oil distillation is different and not as strong as some vetivers? Parijata sounds really intriguing from your review. The first time I wore them, I also put on some Haitian vetiver oil — it was much stronger and earthier than whatever vetiver oil Persephenie is using. So, they do all smell like vetiver, but the vetiver doesn’t necessarily take over. Blue Lotus smells mostly like vetiver too quickly, and Tuberose, while not as light as Blue Lotus, smells mostly like vetiver eventually. In the Parijata, it’s hardly noticeable except as a “normal base note” if that makes any sense. I would say the same of Hina, it is earthy but you don’t smell it and immediately think of it as primarily vetiver. But the bonus is that as the other elements fade, you still smell like vetiver for hours, & even through a shower. That’s more than what you get with many natural fragrances, as you know! I’m not at all a tuberose lover, and jasmine and orange blossom are only appreciated as supporting players, generally speaking. Sounds the oriental-like Hina would be much more my style! But at that price, hard to imagine dishing out the cash for even a 1/2 mL sample! It *is* nice to have a comparison that makes Amouage seem like a bargain, though! Hina, or maybe everyone else but me will love Kewda. It is very weird on my skin. But yes, these are really expensive, although I do get why…which is not really the case with Amouage. Robin, it’s not clear to me from the website (not that I’ve read everything) that she is distilling her own attars, as opposed to importing basic attars from somewhere like India and diluting and blending them. I guess I’m sceptical because I remember seeing vetiver attars on Tiger Flag or other websites a few years ago that sound like the same thing. The body products do sound tempting. Well, that’s a good question…it does not specifically say she is doing it herself, you’re right. But it does say the materials are distilled into vetiver oil, which would *not* imply later blending or diluting. And then they’re aged for some time period. Even if it’s being done elsewhere, it’s labor intensive, takes a lot of plant materials, and does not seem to be done on a large scale, so for me, doesn’t really change things whether she’s doing it herself or paying for it, I guess, but I will update the article to note that I don’t know if she’s doing it herself — thanks for pointing it out! I do love vetiver – the stronger and earthier the better! Most perfumes using it, use the neutered aroma-chemical version. These sound lovely, although it occurred to me while reading that I could very well do my own blends with my vetiver e.o., which is very dark and thicker than molasses. A drop by itself makes a wonderful fragrance. My vetiver oil is very dark too, and much stronger than these.